This book provides the first and only comprehensive review of the state-of-the-science in bio-derived solvents. Drawing on their own pioneering work in the field, as well as an exhaustive survey of the world literature on the subject, the authors cover all the bases—from bio-derived solvent applications to life cycle analysis to strategies for industrial commercialization—for researchers and professional chemists working across a range of industries. In the increasingly critical area of sustainable chemistry, the search for new and better green solvents has become a top priority. Thanks to their renewability, biodegradability and low toxicity, as well as their potential to promote advantageous organic reactions, green solvents offer the promise of significantly reducing the pernicious effects of chemical processes on human health and the environment. 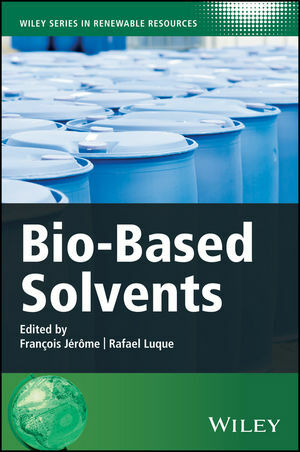 Following an overview of the current solvents markets and the challenges and opportunities presented by bio-derived solvents, a series of dedicated chapters cover all significant classes of solvent arranged by origin and/or chemical structure. Throughout, real-world examples are used to help demonstrate the various advantages, drawbacks, and limitations of each class of solvent. Considering the vast potential for new and better products suggested by recent developments in this exciting field, Bio-Based Solvents will be a welcome resource among students and researchers in catalysis, organic synthesis, electrochemistry, and pharmaceuticals, as well as industrial chemists involved in manufacturing processes and formulation, and policy makers.